I adore this pink shirt right now. I love the vibrant pink shade, the polka dot design and the pretty velvet bow detailing. 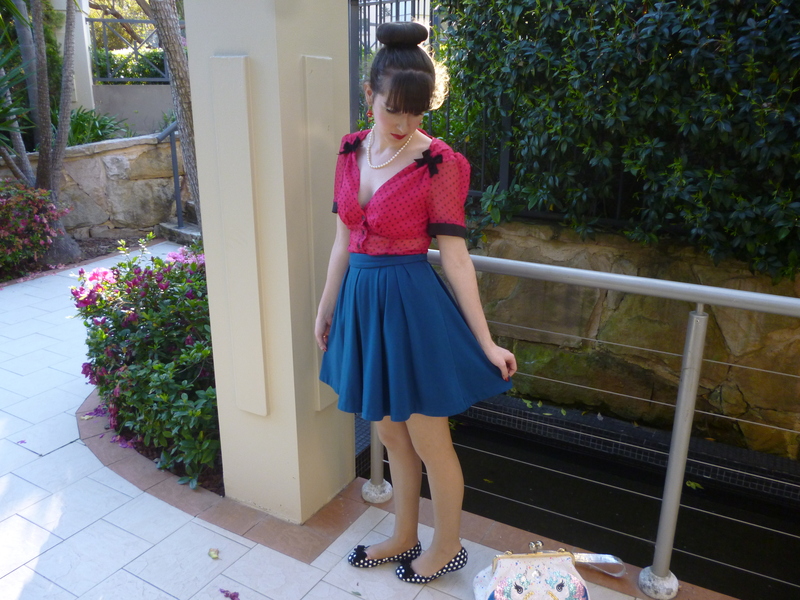 This is the same shirt I have in black which is the ‘God Save the Kitten Blouse’ from Kitten D’Amour. I posted it here although you couldn’t really see much of it with a cardigan over the top. I much prefer it in pink but it’s good to have the black version too because there will always be use for a black shirt. This particular shade of pink is probably my favourite ever colour but it’s hard to find colours which are quite this bright. 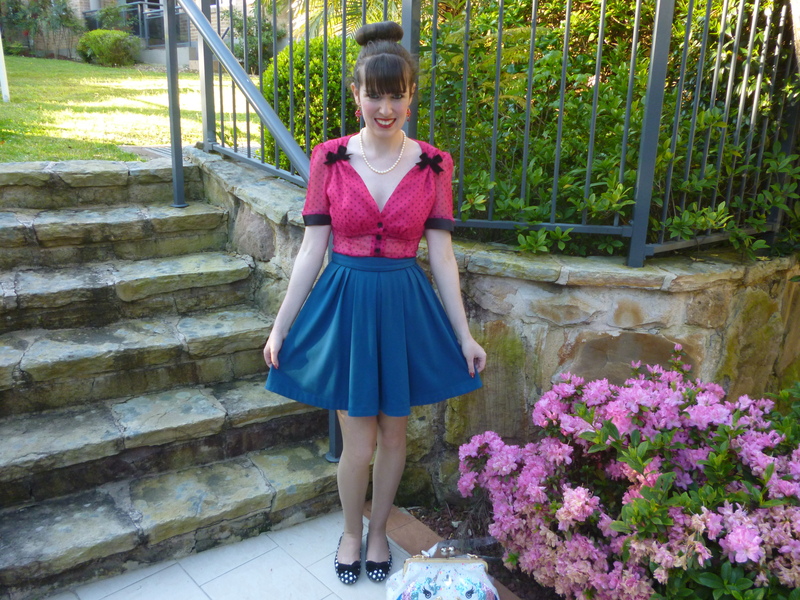 This is the outfit I wore to work last Monday and it was great to add some colour to the beginning of the week. I’m not too sure why I paired it with my teal skirt, it just randomly stood out to me as thought it was just asking to be a part of this look. The outfit possibilities for this shirt are endless and I especially have so many pattern mixing combinations in mind. I opted for the double polka dots with the shoes. I haven’t worn these shoes in ages. I love wearing double of the same pattern in an outfit especially when broken up by a solid colour. In other news, on Friday I have my admission ceremony to become a lawyer. I am so excited and I wish it was Friday right now. There are very few things in life for which I ever get this excited. I will write a blog post on it afterwards. 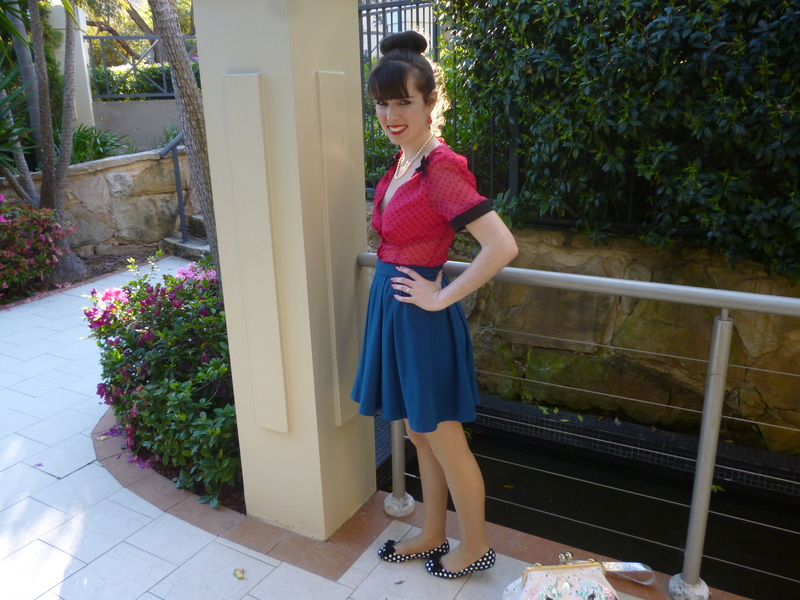 This entry was posted in Irregular Choice, Kitten D'Amour, Outfits, Peep Toe Shoes, Portmans. Bookmark the permalink. This shade of pink is great on you! And congrats on your big achievement to becoming a lawyer!! BTW, I hope you will join me in TBT Fashion link up this Thursday. That blouse is too cute Imogen!! You can never do wrong in my eyes!! loving the look as always. Bows and polka dots will never go out of style to me, and you always do justice to both. I' m following you back! OMG how cute is this outfit! I love the polka dots with polka dots action you got going on! So Cute!!! !